Steve's basic graph is a log-log plot with performance increasing up and to the right. 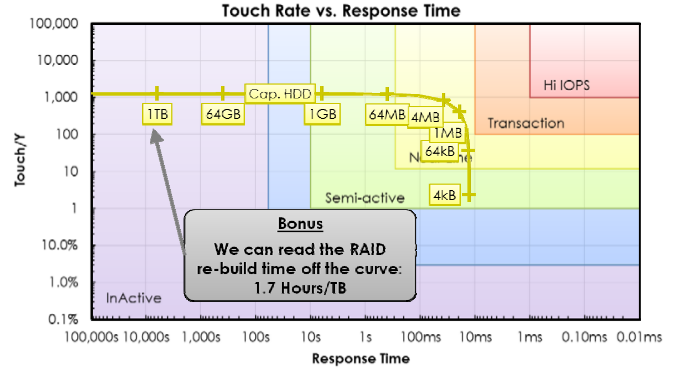 Response time for accessing an object (think latency) decreases to the right on the X-axis and the touch rate, the proportion of the total capacity that can be accessed by random reads in a year (think bandwidth) increases on the Y-axis. For example, a touch rate of 100/yr means that random reads could access the entire contents 100 times a year. He divides the graph into regions suited to different applications, with minimum requirements for response time and touch rate. 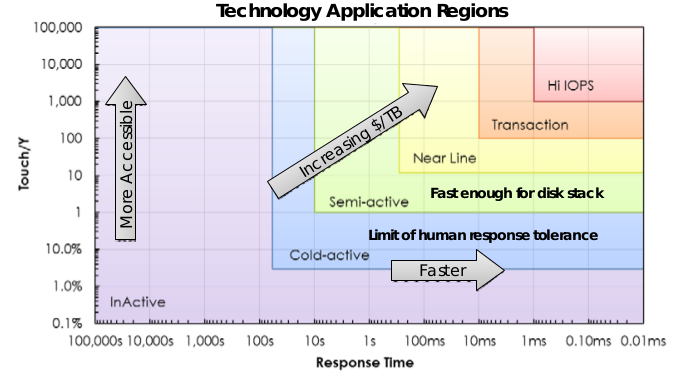 So, for example, transaction processing requires response times below 10ms and touch rates above 100 (the average object is accessed about once every 3 days). 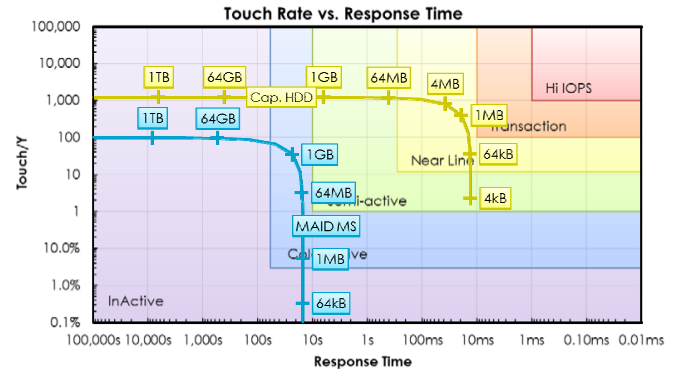 The touch rate depends on the size of the objects being accessed. If you take a specific storage medium, you can use its specifications to draw a curve on the graph as the size varies. Here Steve uses "capacity disk" (i.e. commodity 3.5" SATA drives) to show the typical curve, which varies from being bandwidth limited (for large objects on the left, horizontal side) being response limited (for small objects on the right, vertical side). As an example of the use of these graphs, Steve analyzed the idea of MAID (Massive Array of Idle Drives). He used HGST MegaScale DC 4000.B SATA drives, and assumed that at any time 10% of them would be spun-up and the rest would be in standby. With random accesses to data objects, 9 out of 10 of them will encounter a 15sec spin-up delay, which sets the response time limit. Fully powering-down the drives as Facebook's cold storage does would save more power but increase the spin-up time to 20s. The system provides only (actually somewhat less than) 10% of the bandwidth per unit content, which sets the touch rate limit. The drives have a life-time limit of 50K start/stop cycles. For reasons that are totally opaque, the drives are limited to a total transfer of 180TB/yr. Applying these gives this modified graph. 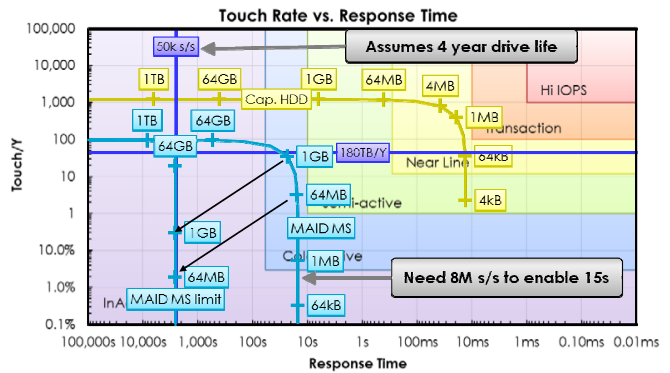 The 180TB/yr limit is the horizontal line, reducing the touch rate for large objects. If the drives have a 4-year life, we would need 8M start/stop cycles to achieve a 15sec response time. But we only have 50K. To stay within this limit, the response time has to increase by a factor of 8M/50K, or 160, which is the vertical line. So in fact a traditional MAID system is effective only in the region below the horizontal line and left of the vertical line, much smaller than expected. This analysis suggests that traditional MAID is not significantly better than tapes in a robot. Here, for example, Steve examines configurations varying from one tape drive for 1600 LTO6 tapes, or 4PB per drive, to a quite unrealistically expensive 1 drive per 10 tapes, or 60TB per drive. Tape drives have a 120K lifetime load/unload cycle limit, and the tapes can withstand at most 260 full-file passes, so tape has a similar pair of horizontal and vertical lines. The reason that Facebook's disk-based cold storage doesn't suffer from the same limits as traditional MAID is that it isn't doing random I/O. Facebook's system schedules I/Os so that it uses the full bandwidth of the disk array, raising the touch rate limit to that of the drives, and reducing the number of start-stop cycles. Admittedly, the response time for a random data object is now a worst-case 7 times the time for which a group of drives is active, but this is not a critical parameter for Facebook's application. 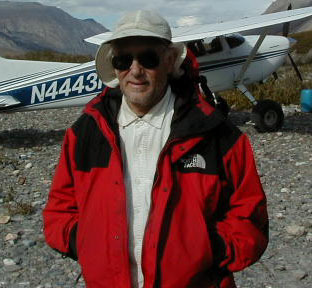 Steve's metric seems to be a major contribution to the analysis of storage systems. Steve Hetzler and Tom Coughlin now have a 24-page white paper on the Touch Rate metric that is well worth studying.